Telling the truth or saying you are sorry is not always easy, but it’s the right thing to do. These two beloved Hermie & Friends stories illustrate how God loves for us to choose our words carefully. In Flo the Lyin’ Fly, the garden bugs grow tired of Flo’s flood of fibs. Like the little boy who cried wolf, Flo thinks it’s fun to tell stories that aren’t true. 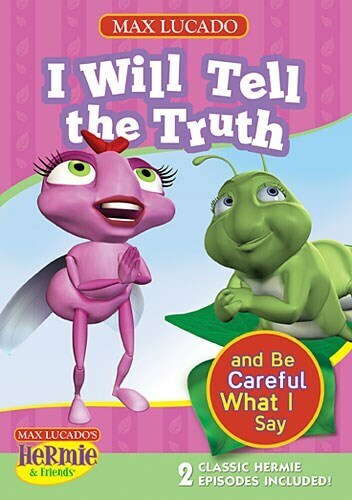 When Hermie and his friends discover they can’t trust Flo, they refuse to believe her when there’s real trouble. With all her lies catching up to her, Flo discovers the importance of always telling the truth, no matter what! In The Flo Show Creates a Buzz, things don’t go as expected when Flo gets her very own TV talk show. She has to think about what to say, what to wear, and who to invite as guests. What she isn’t thinking about are other people’s feelings. After insulting every guest on her show and embellishing the truth to boost ratings, Flo realizes she owes them an apology. Flo learns that words are very powerful and saying you are sorry can make all the difference!